We use our 75 years of experience to craft dairy farm equipment that is built to last. For traditional-milking farms, the best milk cooling solution is what Paul Mueller Company set out to accomplish in 1955. With 63 years of experience under our belts, we have perfected a dairy farm cooling system that is ready to work long and hard for your farm. A Mueller milk cooling solution provides efficiency, protection and quality to your process. 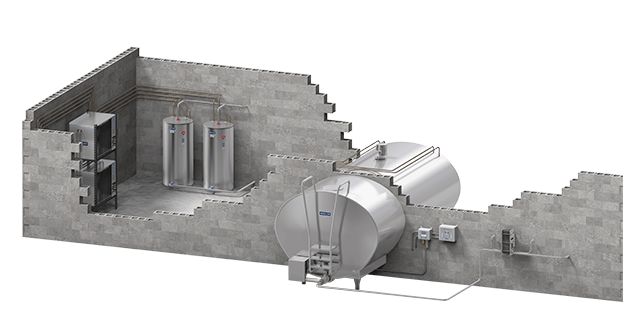 Our Cooling Solution consists of five main aspects: pre-cooling, storage, tank cooling, heat recovery, and wash. Pre-cool your milk within 2 degrees of your well water temperature prior to storing in the Mueller Milk Cooler. The E-Star HiPerForm Refrigeration unit, the heart of all Mueller Milk Cooling Solutions, will take it from there. As the E-Star removes the remaining heat from the milk, it distributes it back into your potable hot water system. This equates to 135-155 degrees of free hot water in one of three sizes: 50 gallon, 80 gallon, or 120 gallon. After the milk hauler has picked up the 36 degree milk, the HiPerForm III wash control and its fully customizable programs will take it from there. Your devotion to your farm isn't short-term and neither is our equipment. We design and engineer our milk cooling and storage solutions to keep your dairy farm operations running strong today and for generations to come. Customize cooling, agitation, and washing functions to fit your milk cooling schedule. Rely on our innovative technology to cool your milk as quickly and efficiently as possible. Continuing the automation from your milking system to your cooling system to pickup. Matched perfectly with robotic milking this unit adjusts to and cools small amounts of milk efficiently. Recover wasted heat and generate free hot water on your farm for even greater savings. We are proud to partner with these leaders in the dairy farming industry. From legacy farms that have thrived through multiple generations to solar cooling in Africa that is providing young children their first taste of cold milk, our equipment is impacting lives around the world.